Yankees pitcher Domingo German is Sunday’s Box-Toppers Player of the Day. Also Sunday, Nationals pitcher Max Scherzer rises to second place in Box-Toppers season player rankings after earning National League Player of the Day honors. Player of the Day—German struck out nine over six scoreless innings, allowing no hits and two walks, in the 7-4 win over the Indians. German picked up a no-decision and did not earn the win because the game was in a scoreless tie when he exited. While German exited pitching a no-hitter after 84 pitches, subsequent Yankees relievers gave up a total of four hits in the final three innings. National League Player of the Day—Nationals pitcher Max Scherzer struck out 15 over 6 1/3 innings, allowing one run, five hits and two walks, in the 5-4 win over the Phillies. Scherzer picked up a no-decision and did not earn the win because the Phillies took the lead after he exited. Scherzer earns 1.7 Box-Toppers points for being NL Player of the Day, giving him 9.4 for the season, rising from third to second in season player rankings, just behind overall leader, Yankees pitcher Luis Severino (9.7). He maintains his first place ranking among NL pitchers. List of top 100 players since 1995 at the end of the 2017 season. Scherzer also now has 166.1 career Box-Toppers points, rising to 13th place among all players since 1995, when Box-Toppers tracking began. With his points Sunday, he passes Roger Clemens (164.8) on the “all-time” list. (It should be noted that Clemens would have an estimated 320 Box-Toppers points if his entire career from 1984 were tracked.) Scherzer now trails 12th-ranked player Johan Santana (166.6). American League Batter of the Day—Mike Trout of the Angels hit a three-run homer and went 3-for-4, scoring once and driving in three runs, in the 8-2 win over the Mariners. National League Batter of the Day—A.J. Pollock of the Diamondbacks tripled and went 2-for-3, scoring once and driving in two runs, in the 3-1 win over the Astros. Notable—Red Sox pitcher Chris Sale now has 113.5 career Box-Toppers points after earning Player of the Game honors Sunday. Sale (7IP 4H R BB 12K W in the 6-1 win over the Rangers) has 2.0 points on the season. Sale led all players in Box-Toppers points in 2017 with 25.1. Debut—Giants pitcher Andrew Suarez made his Box-Toppers debut Sunday with his first career Player of the Game honor. Suarez (5.1IP 7H R 0ER BB 6K W in the 4-3 win over the Braves) made his Major League debut April 11 and was playing in his third career game. He is the 3,963rd player to debut in Box-Toppers since record keeping began in 1995. Scoring—German earns 2.0 Box-Toppers points for being Player of the Day and Scherzer earns 1.7 points for being NL Player of the Day. Trout and Pollock (that sounds fishy, but it’s true) each earn 1.5 points for being their league’s Batter of the Day. All of Sunday’s other Players of the Game (listed in the chart below) earn 1.0 Box-Toppers point. MLB—Overall Box-Toppers Player of the Day, worth 2.0 total Box-Toppers points. 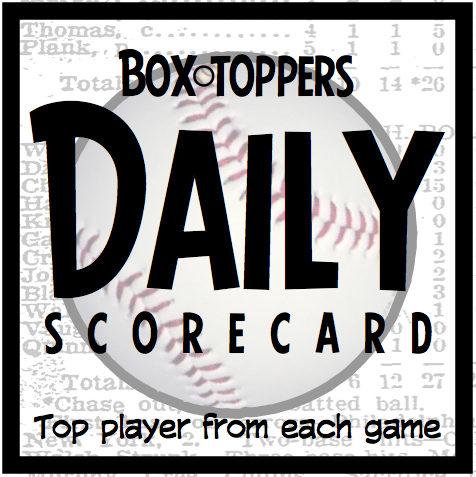 AL—Overall American League Player of the Day, worth 1.7 total Box-Toppers points. NL—Overall National League Player of the Day, worth 1.7 total Box-Toppers points. BAT—Top AL or NL Batter of the Day, worth 1.5 total Box-Toppers points. All other players listed here earn Player of the Game honors, worth 1.0 Box-Toppers point. ` Pitcher had a no-decision in the game and did not pick up a win or a save. Here are Box-Toppers point totals of each of the Players of the Game. Players are ranked by their Box-Toppers point total for the current season (’18). also shown are each players’ Box-Toppers point total for this season and last (’17-18), the period 2013-2018 (’13-18) and each players’ career point total. also shown is how their 2018 Box-Toppers point total compares with their 2017 total (+/-).